An unfinished basement is a nice selling feature for a home. It presents the prospective new owners with a lot of possibilities. It could be the first genuine remodel project. Unfortunately, sometimes an unfinished basement becomes the home’s storage unit. It makes sense to put all the stuff you’re not using down into the basement you’re not using. If you’re ready to get your unfinished basement finished, then you’ll have to clear out that junk and that’s where Junk King Albany can be a big help. Of course, a basement doesn’t have to be unfinished to become a storage area. It just needs easy access. But just because you are able to get something down into the basement doesn’t mean it is easy to bring it up again. With Junk King on the job, that challenge becomes very easy. When you set up an appointment with Junk King, you’ll be assigned not one, but two movers. In some cases, there might even be three movers. This is the squad who is going to make all the difference when it comes to cleaning out the unwanted stuff from your basement. You only job in all of this is to point to all the things you want removed. Then you get to sit back and watch the Junk King team do their thing! Because Junk King is doing all the work, you don’t have to factor in weight or size when deciding what you want to get rid of. The Junk King crews have plenty of experience moving all kinds of objects, big and small. They won’t have any issues with getting rid of what you want to clear out. Once they’ve got the items brought up from your basement, the goal is to get it all onto the Junk King truck in as little space as possible. They do this so they can make other pickups and to provide you with a low price. The less space your stuff takes up, the less you’ll be paying. 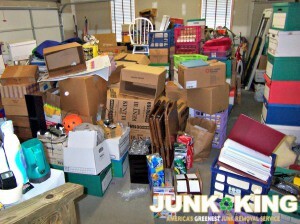 You can finally get your basement cleared of unwanted rubbish with help from Junk King Albany. Are you ready to make that call today? This entry was posted in Albany Junk Removal and tagged basement, Junk King, junk removal on October 31, 2018 by Junk King. Last updated October 31, 2018 . 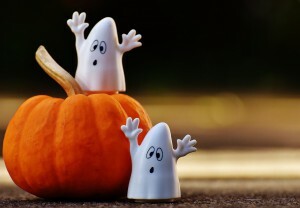 This is the time of year when a lot of folks intentionally want to get scared. Whether they’re visiting a haunted house or watching a horror flick, the goal is to scream and get the heart racing. That seems odd but it is the Halloween season. There is also a lot of things in our lives that are deemed scary that don’t actually involve ghosts or goblins. That could be the amount of junk you’ve accumulated over the years. When you think about how quick it took to fill up a garage with clutter, it is a bit scary. Fortunately, there is a way to turn that all around and it starts with a call to Junk King Albany. The first call sets a plan into motion that can help you transform your home. When was the last time you went through all the stuff you have in your garage? They will probably be a lot of things you’re going to want to keep such as holiday decorations, tools and winter gear. But there could be just as much stuff that you can get rid of. A garage often becomes a home’s storage unit where all the broken things that can’t be tossed out into the garbage end up. Wouldn’t you like to free up that space? Even if you’re not going to use it for more storage, it will just make things more organized. That’s a good goal to achieve. You can take that same approach to sorting through the scary clutter throughout the rest of your home. When was the last time you went through your closets? There could be all kinds of things in there that you forgot you even had. They might be the same things you can now do without. All of this clutter can be turned over to Junk King for fast removal. They’re going to provide a truck and crew to do all the removal work. You won’t have to lift a finger beyond pointing to what you want taken away. Put Junk King Albany to work making all your scary junk disappear today! You’ll be glad you did! This entry was posted in Albany Junk Removal and tagged Halloween, junk, Junk King, junk removal on October 22, 2018 by Junk King. Last updated October 22, 2018 .